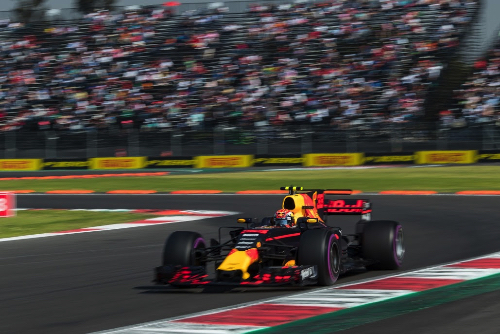 Max Verstappen won the Mexican Grand Prix today in his Red Bull, taking the lead in the first corner and never looking back,19.6 seconds ahead of Valtteri Bottas in the Mercedes GP in second place, and Kimi Raikkonen (54.0s) in the Ferrari took third place. Lewis Hamilton finished in only ninth place, but with Vettel finishing outside the podium, clinches his fourth World Championship. Sebastian Vettel (70.0s) in the Ferrari finished fourth, followed by Esteban Ocon (1 lap) in the Force India-Mercedes was fifth, Lance Stroll, on his 19th birthday, in the Williams-Mercedes was sixth, Mexican Sergio Perez in the second Force India was seventh, Kevin Magnussen in the Haas-Ferrari was eighth, Lewis Hamilton in the Mercedes was ninth and Fernando Alonso in the McLaren-Honda finished in the final points position in tenth. Verstappen takes his second win of the season and third of his career. Before the start the weather was fine in preparation for the start. Vettel sat on pole with Verstappen alongside on the first row, Team mates Hamilton and Bottas sat on row two, Raikkonen and Ocon on row three, Nico Hulkenberg and Carlos Sainz on row four, and Mexican driver Perez and Massa rounded out the top ten starters on ultrasoft tyres - with a grid penalty for an engine change, Daniel Ricciardo will start in 16th. Hamilton only needs to finish in the top five places to lock up the drivers championship. There was a minute of silence before the start to honour the victims of the earthquake in Mexico earlier in the year. Hamilton reports to the team that his seat is roasting as he gets in his Mercedes. Romain Grosjean and Alonso are the only two starters on supersoft tyres. At the appointed time, the drivers took the formation lap and lined up on the grid. The lights went off and the race started with polesitter Vettel gets a quick start but at the end of e long front straight Vettel, Verstappen and Hamilton go into the first corner neck to neck, Verstappen taking the lead. Hamilton and Vettel touch, Hamilton has a flat tyre. Hamilton limps around to the pits, Vettel pits for a new front nose and switches to soft tyres - Hamilton pits and switches to soft tyres as well. Massa and Sainz also pit ans switch to soft tyres. Verstappen tells the team "simply, simply lovely". At lap 4 Verstappen leads Bottas, Ocon, Hulkenberg, Perez, Raikkonen, Ricciardo, Stroll, Magnussen and Marcus Ericsson in tenth place. At lap 6 Ricciaedo pits and the team retires the car. Verstappen sets fast lap at 1m21.299s. Hamilton asks the team, "did he hit me delibertely? ", the team replies, "not sure Lewis." At lap 10 Verstappen leads Bottas by 4.7 seconds, followed by Ocon (13.6s), Hulkenberg (16.8s), Perez (18.7s), Raikkonen (20.1s), Stroll (24.8s), Magnussen (32.6s), Ericsson (35.6s) and Vandoorne (36.7s) in tenth - Vettel runs 16th, Hamilton runs 19th. Alonso passes Grosjean for 11th. On lap 13 Vettel passes Massa for 15th place, the two nearly coming together. Vettel says, "are we just pushing each other off the track? Seriously I had my nose ahead." On lap 14 Bottas sets fast lap at 1m21.026s. Grosjean is given a five-second penalty for leaving the track and gaining advantage. On lap 16 Vettel passes Pierre Gasly for 14th place. Verstappen sets fast lap at 1m20.898s. On lap 18 Bottas sets fast lap at 1m20.860s. Perez pits and switches to soft tyres and rejoins in 8th place. On lap 20 Hulkenberg pits for soft tyres. Ocon pits from third and changes to soft tyres and rejoins in fifth place. Stoffel Vandoorne lets Alonso through to take tenth place. Verstappen complains that his brakes are giving him trouble. Verstappen laps Hamilton in 19th place. On lap 21 Vettel passes Vandoorne for 11th place. On lap 25 Verstappen sets fast lap at 1m20.848s. Hulkenberg pulls off the track and retires, the team warning him to get out of the front of the car with a possible kers problem. At lap 25 Verstappen leads Bottas by 8.2 seconds, followed by Raikkonen (28.7s), Stroll (41.6s), Ocon (47.7s), Magnussen (55.7s), Perez (56.4s), Ericsson (67.0s), Alonso (68.0s) and Vettel (68.9s) in tenth place. On lap 28 Ericsson pits from ninth for supersoft tyres and rejoins in 15th place. On lap 29 Hamilton passes Wehrlein for 16th place. The first four runners have still to make their pit stops. On lap 31 Vettel sets fast lap 1m20.698s, and passes Alonso for eighth place. Brendon Hartley pulls off with an engine failure - the Virtual Safety car is deployed. Verstappen, Bottas, Raikkonen, Ocon, Stroll, Magnussen, Gasly, Grojean, and Sainz all pit for tyres. Hamilton and Vettel also pits for supersoft tyres. On lap 34 Raikkonen sets fast lap at 1m20.649s. The next lap Vettel sets fast lap at 1m20.116s. At half-distance on lap 35 Verstappen leads Bottas by 7.9s, followed by Raikkonen (31.6s), Ocon (39.9s), Stroll (47.2s), Perez (50.4s), Magnussen (68.6s), Vettel (69.9s), Alonso (78.3s) and Massa (1 lap) in tenth. On lap 36 Verstappen sets fast lap at 1m19.592s. On lap 38 Vettel passs Magnussen for seventh place. Hamilton passes Wehrlein for 14th place. Red Bull tells Verstappen, "okay, so that was the same time as the previous lap. ", Verstappen replies, "I'm really sorry. ", the team worrying with all the Renault failures so far today they do not want to push too hard. Hamilton passes Gasly for 13th place. At lap 45 Verstappen leads Bottas by 14.1 seconds, followed by Raikkonen (37.5s), Ocon (52.6s), Stroll (58.0s), Perez (62.2s), Vettel (67.7s), Magnussen (1 lap), Alonso and Massa in tenth place. Hamilton passese Ericsson for 12th place. Mercedes tells Hamilton that at the current pace they are targeting him to finish in eighth place. Vettel is closing on Perez in sixth place. On lap 51 Vettel passes Perez at the first corner. Perez immediately pits for ultrasoft tyres and rejoins still in seventh. On lap 53 Hamilton passes Vandoorne for 11th place. On lap 54 Vettel passes Stroll for fifth place. On lap 54 Vettel sets fast lap at 1m19.516s. Vettel closes on Ocon in fourth place, Hamilton passes Massa for tenth place. On lap 57 Ericsson retires in the pits with smoke pouring from his Sauber. Vettel passes Ocon and takes fourth place. Vettel sets fast lap at 1m19.214s. Vettel is 24 seconds behind Raikkonen is third position. At lap 60 Verstappen still leads Bottas by 17 seconds, followed by Raikkonen (44.1s), Vettel (68.4s), Ocon (74.1s), Stroll (75.6s), Perez (1 lap), Magnussen, Alonso and Hamilton in tenth place. Alonso closes on Magnussen in eighth place, with Hamilton close behind. Sainz retires to the pits. Stroll closes to within a second of Ocon in fifth place. On lap 65 Verstappen sets fast lap at 1m18.892s. On lap 69 Hamilton battles with Alonso in ninth place, the two going back and forth, finally Hamilton taking the position. Vettel sets fast lap at 1m17.785s. At lap 70 Verstappen leads Bottas by 20.3s, followed by Raikkonen (53.1s), Vettel (69.2s), Ocon (1 lap), Stroll, Perez, Magnussen, Hamilton and Alonso in tenth place. Verstappen takes the win, and Hamilton the championship - Hamilton driving on the cool-down lap is waving the British flag.